Community water systems (CWS) are public water systems that supply water to the same population year-round. In fiscal year (FY) 2017, more than 300 million Americans (U.S. EPA, 2018a)—roughly 94 percent of the U.S. population (U.S. Census Bureau, 2018)—got at least some of their drinking water from a CWS. This indicator presents the percentage of Americans served by CWS for which states reported no violations of EPA health-based standards for more than 90 contaminants (U.S. EPA, 2018a). Health-based standards include Maximum Contaminant Levels (MCLs), Maximum Residual Disinfection Levels (MRDLs), and Treatment Techniques (TTs). An MCL is the highest level of a contaminant that is allowed in drinking water. An MRDL is the level of a disinfectant added for water treatment that may not be exceeded at the consumer’s tap without an unacceptable possibility of adverse health effects. A TT is a required treatment process (such as filtration) intended to reduce the level of a contaminant in drinking water (U.S. EPA, 2018b). TTs are adopted where it is not economically or technologically feasible to ascertain the level of a contaminant, such as microbes, where even single organisms that occur unpredictably or episodically can cause adverse health effects. Compliance with TTs may require finished water sampling, along with quantitative or descriptive measurements of process performance to gauge the efficacy of the treatment process. In general, MCL-regulated contaminants tend to have long-term rather than acute health effects, and concentrations may vary seasonally. Thus, compliance is based on averages of seasonal, quarterly, annual, or less frequent sampling. This indicator tracks the population served by CWS for which no violations were reported to EPA annually for the period from FY 1993 to FY 2017, the latest year for which data are available. Results are reported as a percentage of the overall population served by CWS, both nationally and by EPA Region. This indicator also reports the number of persons served by systems with reported violations of standards covering surface water treatment, microbial contaminants (microorganisms that can cause disease), disinfection byproducts (chemicals that may form when disinfectants, such as chlorine, react with naturally occurring materials in water and may pose health risks), and other contaminants. The indicator is based on violations reported quarterly by states, EPA, and the Navajo Nation, who each review monitoring results for the CWS that they oversee. Of the population served by CWS nationally, the percentage served by systems for which no health-based violations were reported for the entire year increased overall from 79 percent in 1993 to 93 percent in FY 2017 (Exhibit 1). Drinking water regulations have changed in recent years. This indicator is based on reported violations of the standards in effect in any given year. When results are broken down by EPA Region, some variability over time is evident (Exhibit 2). Between FY 1998 and FY 2017, most Regions were consistently above the national percentage. Only Region 2 remained consistently below the national percentage over the entire period of record, largely because of a small number of public water systems serving large populations. 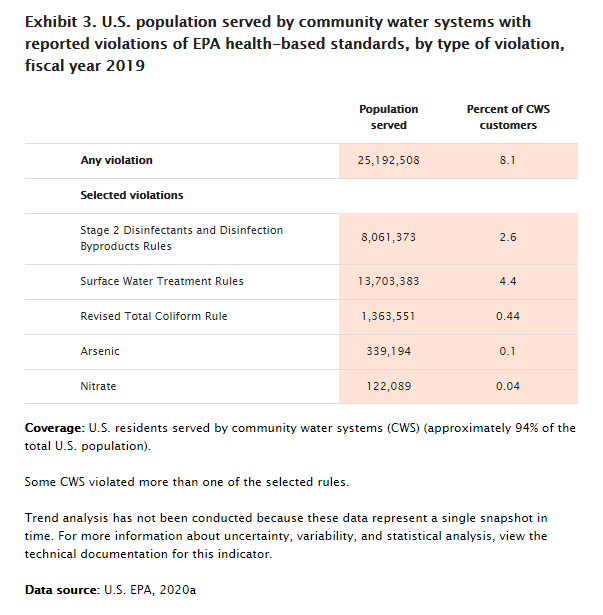 In FY 2017, reported violations involving surface water treatment rules were responsible for exceeding health-based standards for 12 million people (4 percent of the population served by CWS nationally). Reported violations of the health-based disinfection byproducts rules (Stage 2) affected 8 million people (3 percent of the CWS-served population) (Exhibit 3). Non-community water systems (typically small systems) that serve only transient populations such as restaurants or campgrounds, or serving those in a non-domestic setting for only part of their day (e.g., a school, hospital, or office building), are not included in population served figures. Domestic (home) use of drinking water supplied by private wells is not included. More than 13 million households get at least some of their drinking water from private wells (U.S. EPA, 2018c). Bottled water, which is regulated by standards set by the Food and Drug Administration, is not included. National statistics based on population served can be volatile, because a single very large system can sway the results by up to 2 to 3 percent. This effect becomes more pronounced when statistics are broken down at the regional level, and still more so for a single rule. Some factors may lead to overstating the extent of population served by systems that violate standards. For example, the entire population served by each system in violation is reported, even though only part of the total population served may actually receive water that is out of compliance. SDWIS data does not indicate whether any, part, or all of the population served by a system receives water in violation. Therefore, there is no way to know how many, if any, people are actually drinking water in violation. In addition, violations stated on an annual basis may suggest a longer duration of violation than may be the case, as some violations may be as brief as an hour or a day. Other factors may lead to understating the population served by systems that violate standards. For instance, CWS that purchase water from other CWS are not always required to sample for all contaminants themselves. Under-reporting and late reporting of violations by states to EPA affect the ability to accurately report the national violations total. Data reviews and other quality assurance analyses indicate that the most widespread data quality problem is under-reporting of monitoring violations. Even though these violations are separate from the health-based violations covered by this indicator, failures to monitor could mask violations of TTs, MRDLs, and MCLs. Data for this indicator were obtained from EPA’s Safe Drinking Water Information System (U.S. EPA, 2018a) (https://obipublic11.epa.gov/analytics/saw.dll?PortalPages&PortalPath=/shared/SFDW/_portal/Public&Page=Summary). This database provides information about violations in the public water system. Users can filter the data to see inventory or violation summaries. U.S. Census Bureau. 2018. Monthly population estimates for the United States: April 1, 2010 to December 1, 2017. Accessed May 2018. https://www.census.gov/data/tables/2016/demo/popest/nation-total.html. 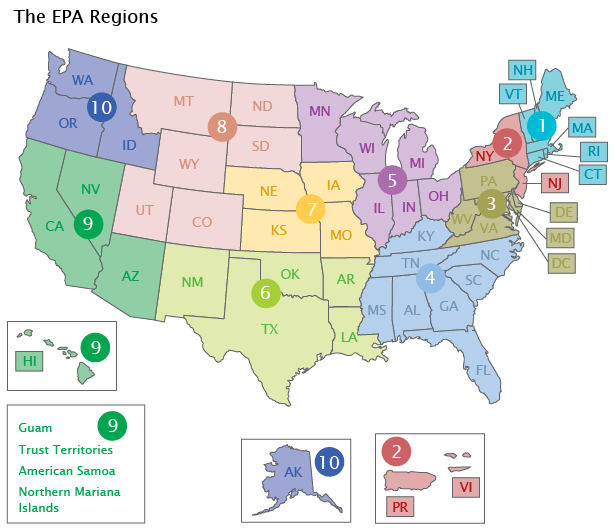 U.S. EPA (United States Environmental Protection Agency). 2018a. Government Performance and Results Act (GPRA) tool. Accessed June 2018. https://obipublic11.epa.gov/analytics/saw.dll?PortalPages&PortalPath=/shared/SFDW/_portal/Public&Page=Summary. U.S. EPA. 2018b. National primary drinking water regulations. Accessed May 2018. https://www.epa.gov/ground-water-and-drinking-water/national-primary-drinking-water-regulations. U.S. EPA. 2018c. Private drinking water wells. Accessed May 2018. https://www.epa.gov/privatewells. U.S. EPA. 2008. 2006 drinking water data reliability analysis and action plan: For state reported public water system data in the EPA Safe Drinking Water Information System/Federal Version (SDWIS/FED). March 2008. https://nepis.epa.gov/.